The Silent Partner RFID Forklift Safety Solution offers extensive help to warehouse operators by offering – employee safety and the equipment location. With our enhanced services owners will not have to worry about any missing equipment or injury. 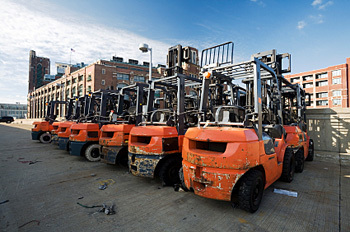 Is your staff facing forklift accidents? If yes, then its time to use RFID to reduce and eliminate these at your warehouse. Most people must be wondering how is it possible? Well, the answer is quite simple with our RFID Warning Light system employees working in the warehouse are alerted to any oncoming forklifts ahead of time. The sound and the light give them ample time to get themselves to safety. Like all managers, you worry a lot about your worker’s well-being and the company’s reputation for this Forklift safety solution is what you need today. Well, forklifts are notorious when we use them and often obscure the forklift operator’s vision. They are simply built with blind spots, to begin with, and once large boxes are added, the visibility decreases even more. Even the quickest look here or there can cause a worker to go from a forklift operator to a force of destruction. Although they are big in size, but it’s impossible for employees to move out-of- the- way, if they don’t know a forklift is coming their way. These actions are normal day to day operations, but they can obviously be hazardous for your employees. Unfortunately, there have been several reports of employees being injured by a forklift as they were unaware, especially when it suddenly appears from a blind corner. Silent Partner Tecnhology’s RFID forklift safety solution creates an easy warning system that alerts the employees about an oncoming vehicle. It prevents the action before it begins. Our unique warning light system. As tagged forklifts near the designated “danger” areas, lights will automatically begin to flash, warning passers-by to move out of harm’s way. We have designed our system in such a way that not only the driver of the forklift in fact, everyone in the warehouse is aware of the forklift’s motions. The RFID forklift solutions make it easy for every worker to be aware of their own safety. Hence, they become more efficient and can now concentrate on their work more than before. Our system helps in creating a productive and safe environment using effortless RFID tracking systems. Just like us, you all think of your team of employees as a family. Well, in all families there is always this one person who forgets to put things where they belong. But in your family, the person may have misplaced a forklift. This happens in most places and next to employee injuries, unknown vehicle location is the biggest problem that warehouse operators face as it takes a lot of time and money. Do you need to locate your special forklift with the extended fork? Or maybe the one with the wireless computer on board? The chances that every forklift will be manned and just a call away are very less. Parked vehicles and trained off radios can make it impossible to find them. This is a major concern in a situation when your highest paying client needs the next shipment now. 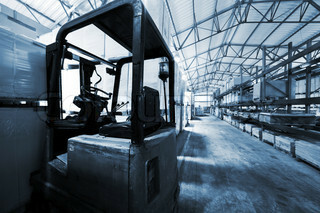 How will you find your missing forklift in time? The answer is with our Real Time Location System (RTLS) finding forklifts and other movable warehouse assets is a piece of cake. We provide you with location specific RFID readers, our patented RFID tags, a web based tracking system, and antennas to monitor and locate your forklifts. By putting the system into to UHF mode, you can bypass Wi-Fi systems without robbing bandwidth from your current applications! This ensures that you’ll be able to quickly find your equipment no matter what the circumstances. With our RFID, RTLS your employees will spend less time looking for forklifts and more time in actually using them. You’ll save time. And time is money. We have both our RFID Warning Light System and our RFID Real Time Location System to work on both very small and very large distribution centers-focusing on being not only effective but affordable as well. We have been in this industry for over 15 years and being a “silent partner” to warehouses and distribution centers all over the country. With our system in implementation, we have received countless success stories from our clients. We know what it takes to run a safe, successful business. If an accident prevention and efficient equipment management are your top priority, then there in no other better time to give us a call than today. Call us today at 888.428.5301 to get started.